A concrete plant, also known as a batch plant or batching plant or a concrete batching plant, is equipment that combines various ingredients to form concrete. China concrete batching plant contains a mixer which is the heart of concrete batching plant China. Mixing is the power of mixing plant. The twin shaft mixer can ensure an even mixture of concrete through the use of high horsepower motors, while the tilt mixer offers a comparatively large batch of concrete mix. The strength of concrete relies on the mixing i.e. if the ingredients are properly mixed; you will get high-quality concrete otherwise concrete may have less quality. A concrete batching plant has two main types. Dry mix concrete plant weighs gravel, sand, and cement in weigh batches using manual scales. After mixing, all the ingredients they are discharged into a chute which discharges into a truck. Water is also added to the mixer in the truck to mix it properly. Then the entire mixer is further mixed to produce the final product. Wet mix concrete plant has a central point in the concrete mixer where all the ingredients are mixed including water. A dry mix concrete batching plant provides consistent and quick mixing than a wet mix concrete plant. Both wet and dry mix concrete plants are operated using a batch computer. 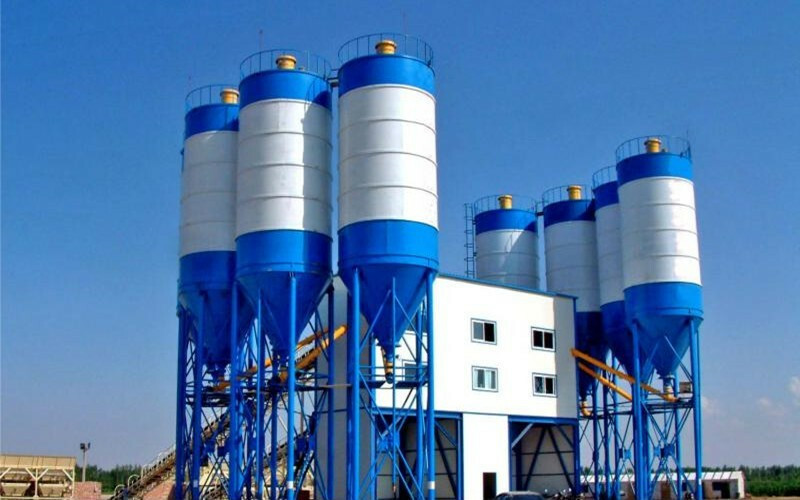 There are different types and versions of concrete batching plants China and concrete mixing plants China. You can get a concrete batching plant which is suitable for you. The size of HZS Concrete Batching Plant is named according to its theoretical production per hour. At present, the commonly used specifications in China are HZS25, HZS35, HZS50, HZS60, HZS75, HZS90, HZS120, HZS150, HZS180, and HZS240. Such as HZS25 refers to a mixing plant with an output capacity of 25 cubic meters per hour. The host is a twin-shaft forced mixer. If the host uses a horizontal shaft, the model number is HZD25. Concrete batching and mixing plant is suitable for both large and small construction projects such as roads, bridges, airports, ports, etc. The concrete batching plant must be operated by professionals and experts to ensure the best results. 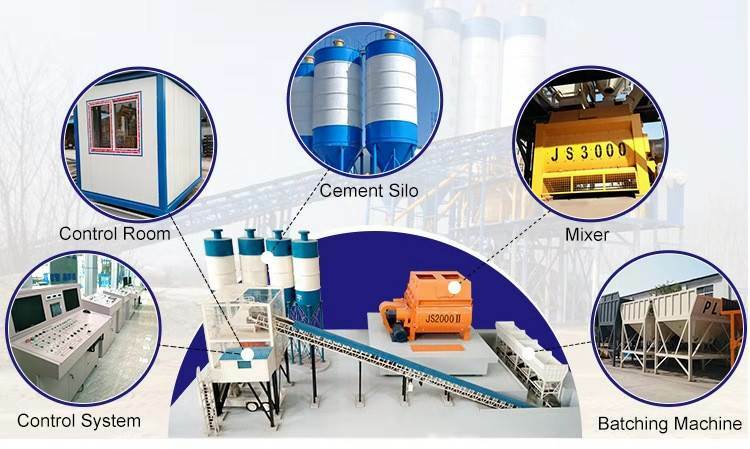 The concrete mixing station is mainly composed of five major systems including material storage system, material weighing system, material conveying system, mixing system, powder storage system, powder conveying system, powder metering system, water and admixture metering system and control system, as well as other ancillary facilities. The main mixer can be divided into forced mixing and drop mixing according to its mixing mode. The forced mixer is the mainstream used in mixing stations at home and abroad. It can mix many kinds of concrete, such as fluidity, semi-dry hardness, and dry hardness. Self-falling mixer mainly mixes fluidized concrete, which is seldom used in mixing station. A compulsory mixer can be divided into spindle planetary mixer, single horizontal shaft mixer, and double horizontal shaft mixer according to its structure. Among them, the comprehensive performance of the double horizontal shaft forced mixer is the best. The Material weighing system is the key components affecting the concrete quality and concrete production cost are mainly divided into aggregate weighing, powder weighing, and liquid weighing. Usually, the mixing station under 20 cubic meters per hour adopts the method of superimposed weighing, that is, aggregate (sand, stone) is weighed by a scale, cement and fly ash by a scale, water, and liquid admixture respectively, and then the liquid admixture is put into the water scale bucket for pre-mixing. In mixing stations over 50 cubic meters per hour, each weighing material is used independently, and all weighing is controlled by electronic scale and computer. The weighing accuracy of aggregate is (+2%) and that of cement, powder, water, and admixture is (+1%). (1). Aggregate conveying: There are hopper conveying and belt conveying in mixing station. The advantages of hopper lifting are small floor area and simple structure. The advantages of the belt conveying are large conveying distance, high efficiency, and low failure rate. Belt conveyor is mainly suitable for mixing station with temporary storage bin of aggregate, so as to improve the productivity of mixing station. (2). Powder conveying: The available powder for concrete is mainly cement, fly ash and mineral powder. The commonly used powder conveying mode is screw conveyor conveying. Pneumatic conveying and scraper conveying are used in large mixing buildings. The advantages of screw conveying are a simple structure, low cost , and reliable use. (3). Liquid transportation: mainly refers to water and liquid admixtures, which are respectively transported by pumps. The materials available for concrete storage are basically the same. Aggregates are stacked in the open air (there are also closed silos for large commercial concrete mixing stations in cities); powder is stored in fully closed steel silos; additives are stored in steel structural containers. The control system of the mixing station is the central nervous system of the whole equipment. The control system has different functions and configurations according to different requirements of users and the size of the mixing station. In general, the control system of small mixing station available in a construction site is simpler, while the system of large mixing station is more complex. 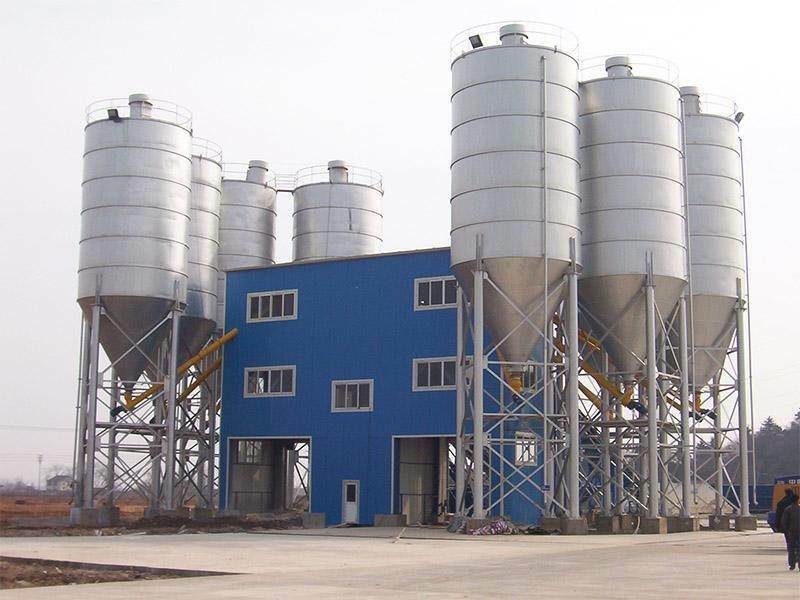 Henan Chunyue Import & Export Co., Ltd. is producing and developing Concrete batching and mixing plants with the best quality that produces high-quality concrete. With our innovative ideas, we are developing the best concrete batching plants for our customers. If you are in China, order the best concrete batching and mixing plant and produce the best quality concrete. We provide a one-year warranty to make sure your machine runs consistently. We always offer lifelong services and provide spare parts for a long term.